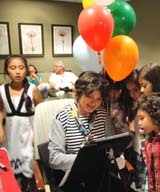 Spex on Oak Park Avenue in Oak Park had a grand opening a couple of weeks ago. (I’m catching up with my posts here.) 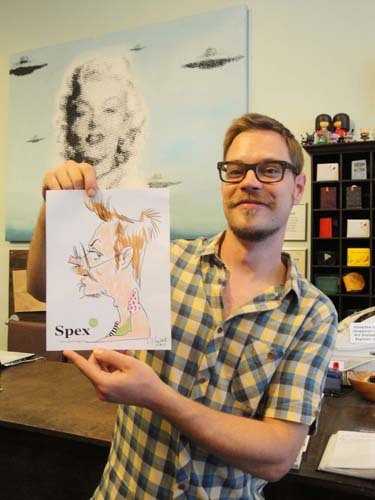 Spex carries upscale eyewear and because they were especially promoting some of their French lines, it was appropriate to get a caricaturist who knew some French. They chose me, but I need to explain about the French part before we go on: my French grammar, learned in college, sounds better when I’m conversing with people who don’t speak French than when real native speakers are around, which was the case in this sophisticated place. But still, the French couple and their daughter Manon understood me and I understood them. It was fun. What wasn’t so much fun was the fact that later I accidentally deleted all my shots from this wonderful event. But all was not lost. I remembered drawing the proprietor of “Chameleon,” a cool clothing store just a couple of doors down the street from Spex. 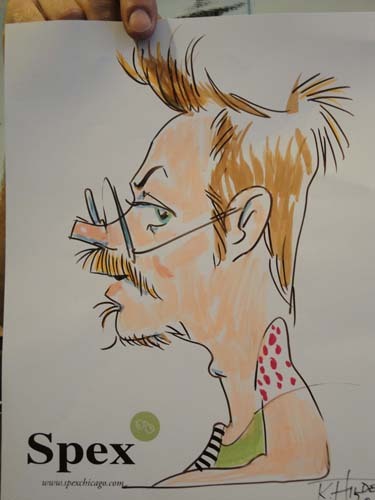 Nick Heitzman was game for a photo op with his Hilden caricature and so I drove back to Oak Park a few days later to get this documentation of my drawing of him, which was one of my favorites from the Spex event. Spex had asked me to preprint the drawing paper with their logo, which is a great idea for any corporate event like a promotion or an opening. 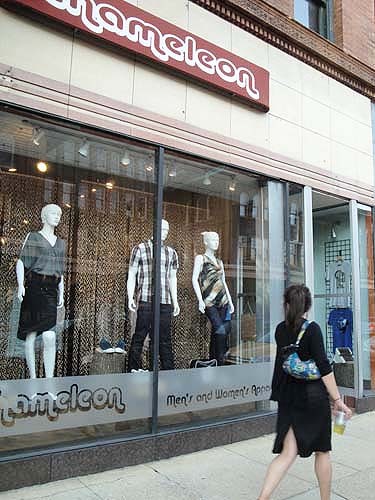 Chameleon is a neat little shop, by the way, recommended to all who want to give the imagination some free reign and like to buy from a smart, engaging store manager.